We asked an expert why having a definition is such a big deal. Europe’s leading human rights organisation has just adopted the first-ever international legal instrument to stop sexism. 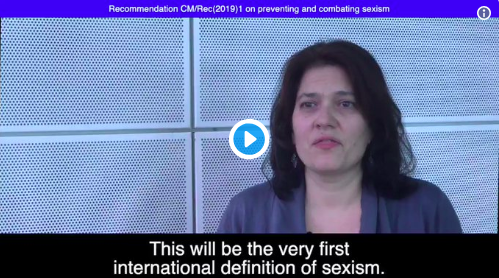 The Council of Europe — which includes 47 member states, 28 of which are members of the European Union — has officially recognised that sexism is “widespread and prevalent in all sectors and all societies,” and is now calling on states to stop it. The council adopated a recommendation to prevent and combat sexism last week. These recommendations are essentially a list of guidelines for member states to be exploring within their own societies. They are intended as a springboard to identify and define an issue, and lay out some ideas about how member states can now be tackling those issues. The recommendation also stressed that sexism is a manifestation of “historically unequal power relations” between men and women — which leads to discrimination and prevents the full advancement of women in society. A particularly interesting point — especially for anyone who’s been accused of being “too sensitive” when it comes to calling out everyday sexism — is that the recommendation makes the link between sexism and violence against women and girls. Visit Global Citizen to take action!